German extrusion machinery maker Reifenhäuser Blown Film has sold five new lines to Asia in only six months to Vietnam, Malaysia, South Korea and Philippines.. The company says it could convince customers due to the high level of production efficiency and reliability. “They deliver products at a constant high level of quality while ensuring a zero error rate throughout the entire production process. In terms of quality, Reifenhäuser has been at the forefront since long. The engineers have consistently come up with new ideas to further optimize the film production process. The results are impressive,” says Eugen Friedel Area Sales Manager. The patented Evolution Ultra Flat film flattening unit integrated in the take-off is an essential module used to enhance the quality. Ultra Flat is able to correct surface irregularities occurring in the production of blown film, according to the firm. Surface irregularities are inherent to the blown film process. They can occur to a greater or lesser extent in the production of packaging film, depending on film dimensions and structures. The resulting waves can cause serious problems in winding and conversion. Reifenhäuser says with its Evolution Ultra Flat a web of optimum flatness can be produced due to minimised stretching of the film via heating-cooling rolls - a prerequisite for winding and conversion on downstream equipment. The Asian market has responded to the newest Reifenhäuser technology with investments in the future. The first blown film line equipped with the Ultra Flat system came on stream in Vietnam about 22 months ago. Further orders followed soon. The line configuration convinced both the owners and other interested customers outside Vietnam. 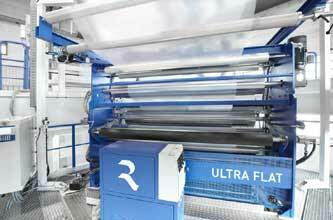 Over the past six months Reifenhäuser recorded orders from Asia for a total of five new blown film lines equipped with the Ultra Flat flattening unit, which the company says allows for an unproblematic conversion of the film, whether in laminating, printing, reforming, packaging or sealing operations.